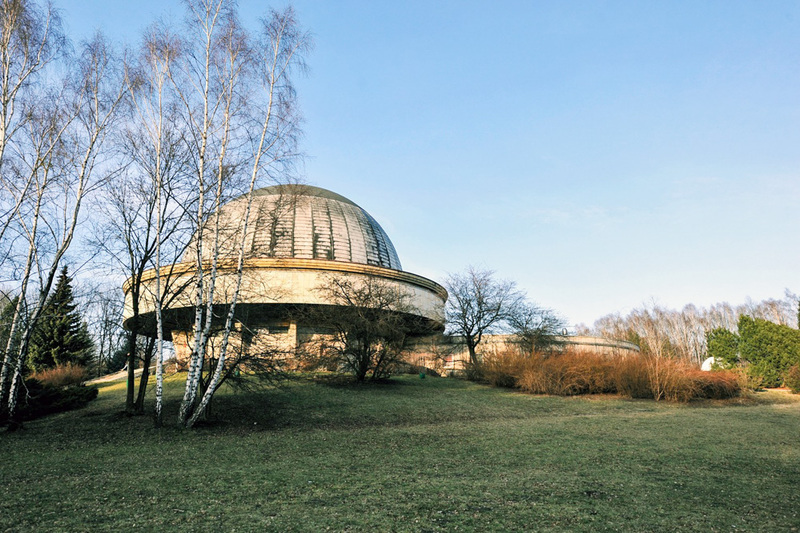 The end of the 1950’s brought the first forays into space, which resulted in the Moon landing on 16th July 1969. Who knew that these exciting events would even leave their imprint on Polish architecture? The first attempts to conquer space go as far back as the end of 1950s when the USA and the Soviet Union started their space programmes, which, unsurprisingly, fired up people’s imaginations. The conquest of space influenced cinematography, design and architecture. The heroes of The Jetsons, the famous cartoon created in the years 1962-1963 by Hanna-Barbera Productions, move around in flying cars and live in houses resembling UFOs. But such buildings were constructed in real life – in Poland too! 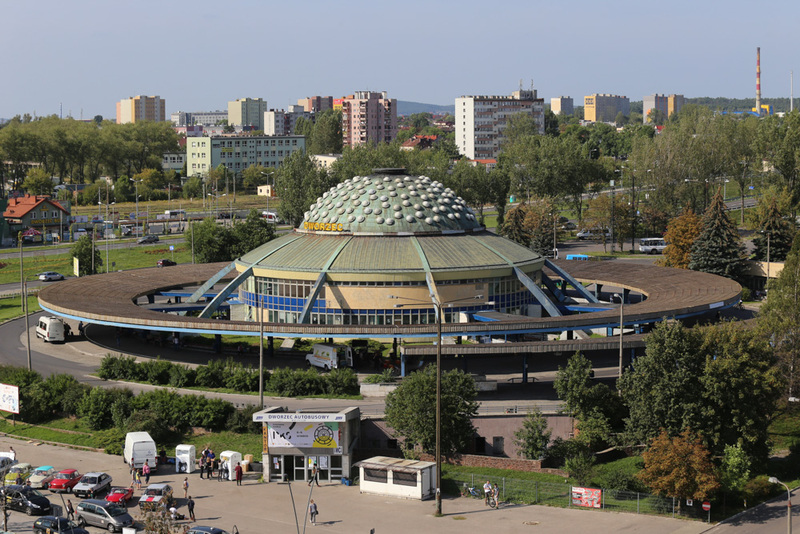 The most famous Polish ‘flying saucer’ is stationed in Katowice. 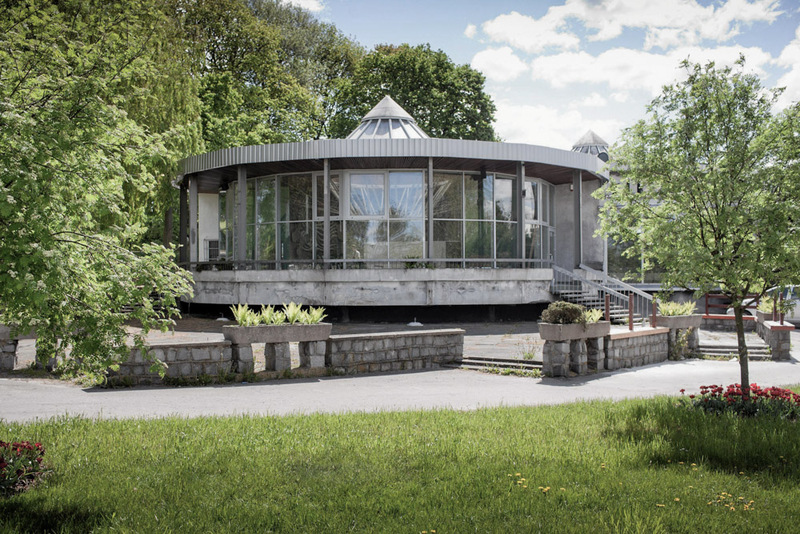 It was constructed between 1965 and 1971, based on the prize-winning design created in 1960 by a team consisting of architects Maciej Gintowt and Maciej Krasiński, and constructors Wacław Zalewski, Andrzej Żórawski and Aleksander Włodarz. The structure of this extraordinary edifice points to its unique character – the ultramodern building appears to be levitating and the impression made by its futuristic shape is strengthened by the fact that the multi-purpose arena is located in the city centre, albeit in a relatively large and open area. 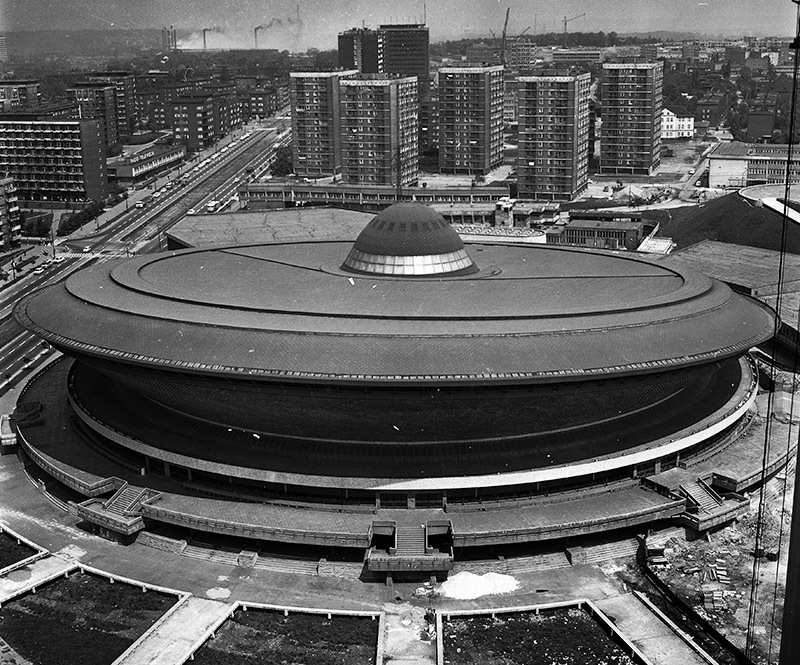 However, the shape of Katowice’s Spodek (which means saucer in Polish) is not actually a result of the architects’ interest in space travel. The atypical character of the design is a result of two factors: the parcel, which was endangered by mining damages, and the functions of the building, which required an interior that would be open to rearrangements. In the 1950s, people spoke a lot about unidentified flying objects, but I’ve always been interested in curved and spherical spaces. 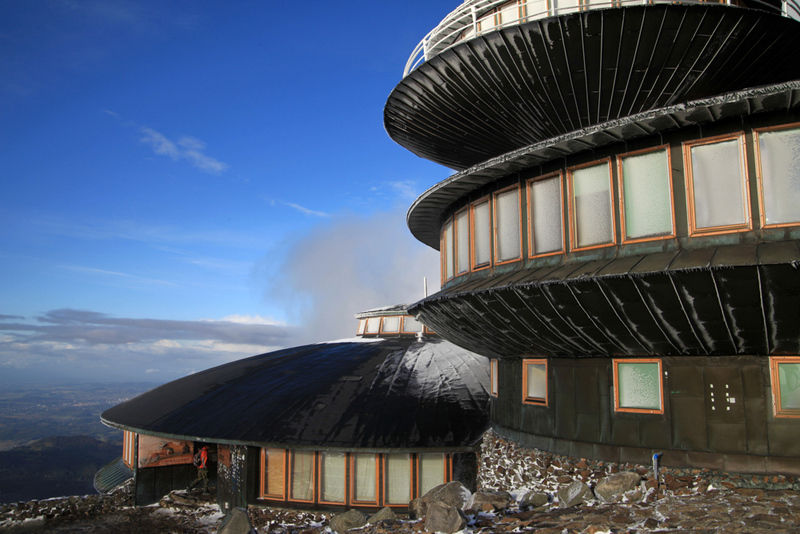 So I decided that the weather observatory on Śnieżka will be shaped like saucers. This is yet another design by Witold Lipiński. 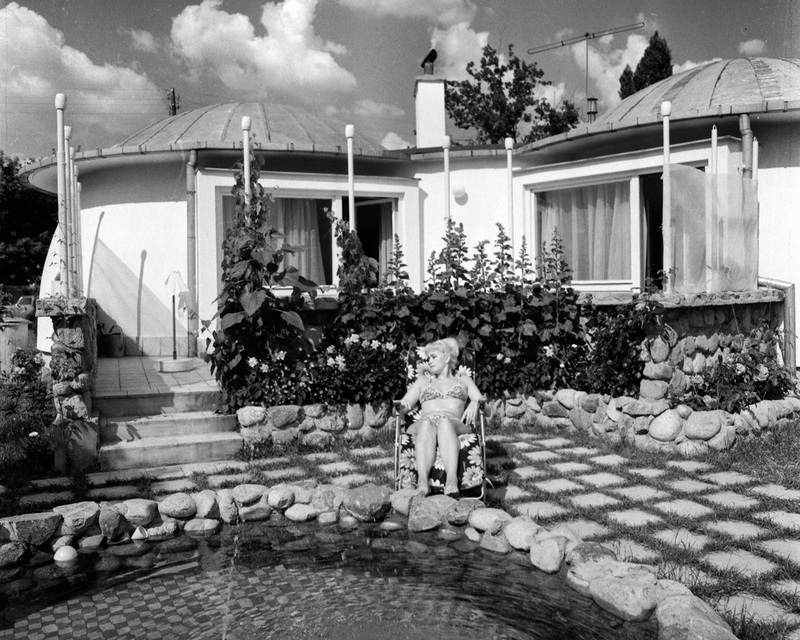 In 1961, he began the construction of a house for himself and his family on Moniuszki Street in Wrocław. A building that strikingly resembles an igloo was erected on a tiny parcel of land. Its main part consists of a dome that touches the ground and measures 10 metres in diameter. Thanks to the light let inside by a large skylight ceiling, it was possible to build a large mezzanine, which increased the living space and allowed the architect to fit a living room, three bedrooms, a kitchen, a bathroom and a large work space inside the house. 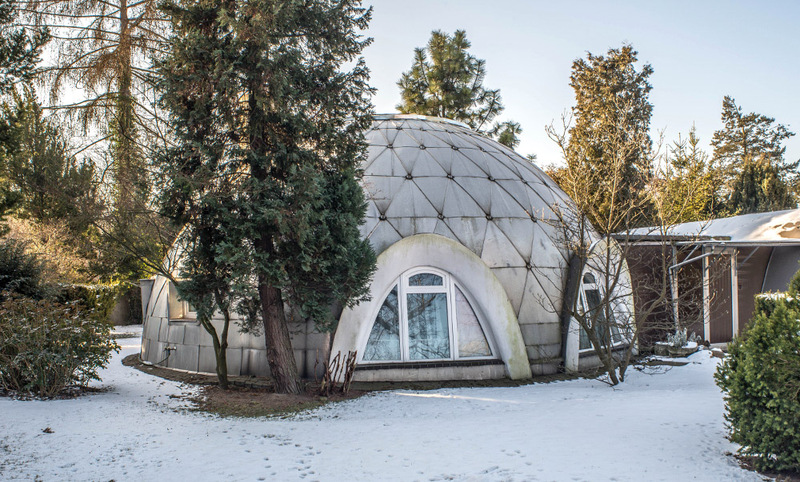 Lipiński was forced to build the domed house mostly on his own (it was difficult to find construction workers ready to build such an atypical structure), using bricks from demolished buildings. The Igloo House was a popular tourist attraction for many years. Some saw it as an example of futurism, others as a return to the shape of the most primal human dwellings made of ice. It is believed that the unorthodox shape birthed a rumour that Witold Lipiński’s wife was Eskimo. In a remote corner of Warsaw, near the Warsaw Chopin Airport, on Ustrzycka Street, a tiny and atypical neighbourhood can be found. Kopulaki (editor’s translation: domed houses), as they are commonly called, are a complex of 10 little detached houses (the initial design envisioned 70 of them), each of which is covered with two or three small domes. The idea behind them was born in 1956 at the Cooperative Association for the Construction of Detached Houses ‘Zakątek’, which catered to university teachers. The distinctive, futuristically-shaped houses (although some see them as mushrooms) were designed by Andrzej Iwanicki and their construction was finished in 1966. The Kopulaki are unique thanks both to their shape and to the fact that there had not been many detached housing neighbourhoods constructed under the communist regime. They are similar to the designs of that era in that they too were constructed using prefabricated elements. In 1984, a UFO landed in the centre of Kielce. It is in that year, when the construction of the city’s main bus station, which strikingly resembles a flying saucer, was finished. The head architect of the building was Edward Modrzejewski, but the design is a result of the efforts of a team of experts – the construction is distinct not only thanks to its interesting shape, but also to its modern structure and, most importantly, to its communicative excellence. It is the desire to make passengers flow freely through it that inspired the building’s shape – it’s circular shape allows passengers to exit the station in every direction, as opposed to the standard four. The station’s waiting hall was covered with a tall dome full of convex skylights. The expressive air of the building is also highlighted by concrete arches that support the structure and by the carport surrounding it. Białystok’s Spodki, four pavilions housing, among others, a café, were built in 1973. The city was chosen to host the National Harvest Festival that year, an enormous event that required the proper infrastructure. This is why these four pavilions, and a few others, were constructed. They were designed by Henryk Toczydłowski, who gave them a futuristic shape of saucers made of sheet metal. This resulted in rather clunky ‘flying objects’. The 1960s and 1970s in Poland saw the construction of quite a few multi-purpose arenas. The architects of such constructions had the liberty of designing original shapes that were limited only by their imagination. 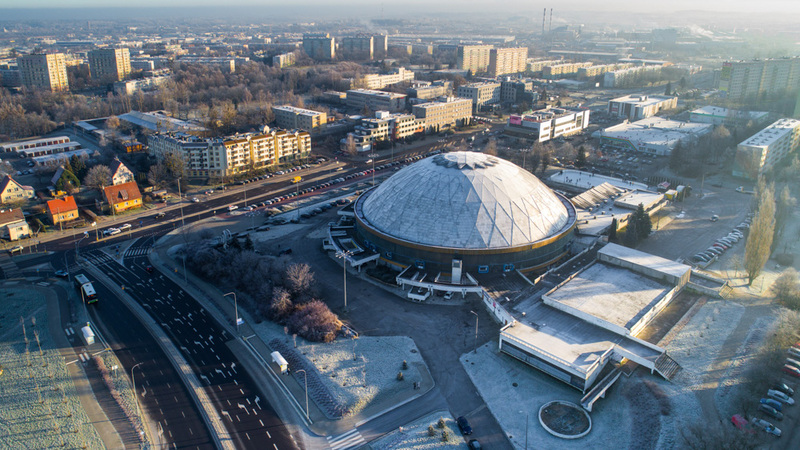 Among these arenas there is the already mentioned Spodek in Katowice, but the Olivia Hall in Gdańsk and the Arena Hall in Poznań are also worth mentioning. The futuristic Urania Hall in Olsztyn has a fitting name. It was designed by Wiesław Zenon Piątkowski and constructed between 1973 and 1978. The building’s dome is surrounded, like a planet, by a ring which, at the same time, serves as the roofing for the entrances and a mezzanine. 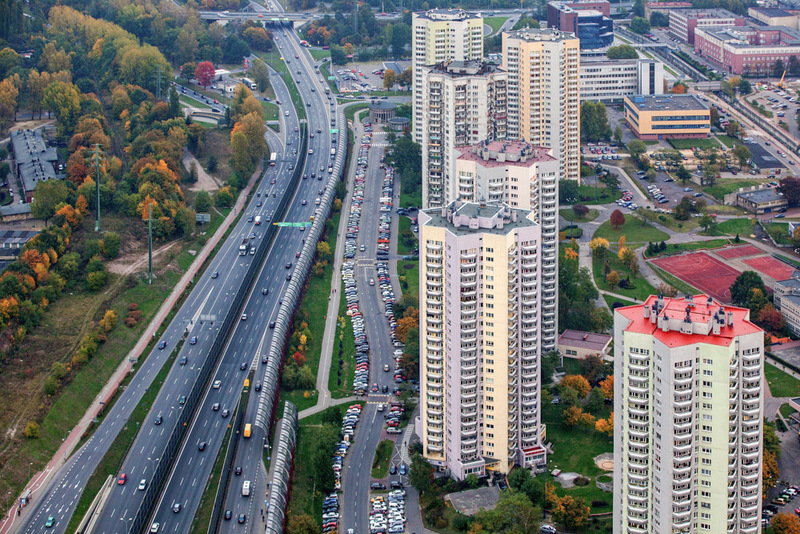 Just as Katowice’s Spodek to a large extent owes its shape to external conditions, the residential blocks of the Roździeński Neighbourhood in the same city have a ‘cosmic’ shape for a specific reason. The complex of 27- storeyed residential buildings is commonly referred to as ‘Stars’ because their walls are arranged to form an eight-pointed star. The neighbourhood, constructed in the years 1972-1978, was designed by Aleksander Franta, Henryk Buszko and Tadeusz Szewczyk, and its unique look is a result of the architects’ wishes to create apartments that would be as sunny as possible. Thanks to the triangular shape of the star’s ‘points’, more sunlight enters the interior of the building than would in square structures. The building, perfect in terms of its proportions and the arrangement of its shapes, is one of the most interesting constructions erected in the Śląski Park in Chorzów. What’s interesting is that it was built in 1955, when the realist socialist doctrine was still in effect. This reserved and simple structure does not fit within the confines of this official style. The design was created by Zbigniew Solawa. The building, made of reinforced concrete, consists of two circular segments: one forms the ground floor with its internal courtyard, and the other, covered by a semi-circular dome, forms the upper, slightly cut-off level. The second level is, of course, the most recognisable part of the observatory, thanks to its 23-metre high dome. It houses a lecture hall with 400 seats. The Widok Neighbourhood in Kraków is famous for its buildings, which went against the trends dominating at the time of their construction. The architect, Krzysztof Bień, tried to defy the stereotypes associated with residential block neighbourhoods and design a space that would be more friendly to its inhabitants. Between 1981 and 1992, a church, designed by the same architect, was constructed at the outskirts of that area. 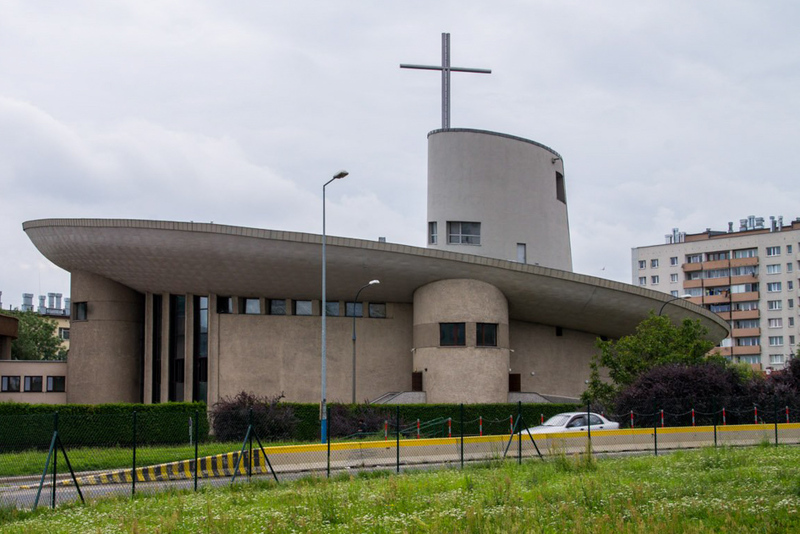 Architecture lovers will notice inspirations from Le Corbusier’s Ronchamp chapel, but more often people compare the church to a spacecraft or a submarine. Just like many other temples built in the 1980s, this one is also met with conflicting opinions and inspires varied interpretations.